The 31st annual Festival of the Bells saw its largest crowd ever during the Thursday evening Christian concert and at least 10,000 people turned out for Saturday’s headline country music performance by Chase Bryant, festival president Mike Bradford said Monday. Bradford said the gospel concert, featuring a band from Hillsboro church Good News Gathering and award-winning group Sidewalk Prophets, was the most well attended in the 10 years a Christian concert has kicked off the festival. He also estimated that 10,000 to 12,000 people turned out for Saturday’s country music performances by RaeLynn and then Bryant. Crowds were somewhat sparse for Friday night’s performances by rock band After Midnight and country musician John King. Bradford said the dates for next year’s festival have not been set. He said that’s largely because July 4 falls on a Monday next year and the committee is trying to decide whether to have the festival the weekend before the Fourth of July or the weekend after. He said the committee is leaning toward the weekend before the holiday, which means it would be held June 30 through July 2. The festival’s annual auction went well, Bradford said, but he did not have a final amount on how much it raised. He said the top selling items were a “flat top” guitar donated by RMA Entertainment, the promoters that signed the entertainers for the festival, and a CS Bell that rang during the opening ceremonies. Bradford said the guitar was signed by all the weekend entertainers and sold for $3,000, and the bell was from the first CS Bell series cast after the company moved from Hillsboro to Tiffin, Ohio. Bradford said the festival scavenger hunt had 10 to 12 participants, and the grocery cart races and Famous Look-A-Like contest went well. He said all three will likely be back next year. He also said the festival parade, organized by the Highland County Firefighters Association, had more fire and rescue entries than it’s ever had. The festival committee had to scramble to find power sources, Bradford said, because local officials said they were going to take down poles the festival power boxes were attached to because they were unsightly. Bradford said the boxes were removed, but the poles were still standing as of the weekend. He said the committee ran some new lines and used a few generators to keep everything supplied with power. 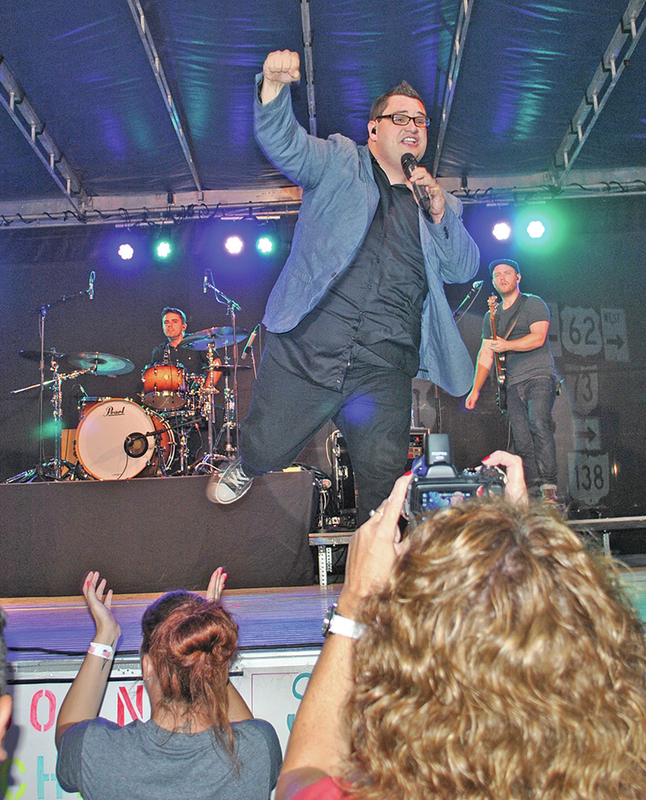 Photo: Sidewalk Prophets perform Thursday night.